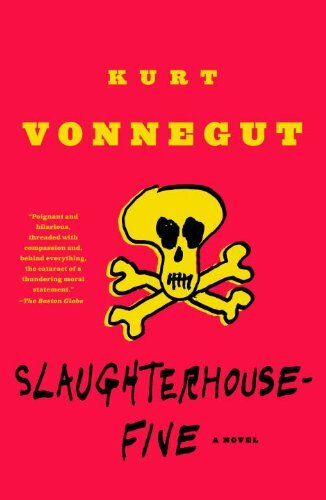 You can now download the classic Slaughterhouse-Five by Kurt Vonnegut for only 1.99$ here. You can also download Breakfast of Champions for 1.99$ here. 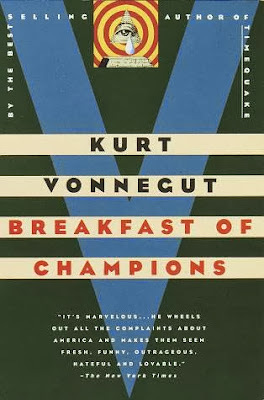 The core of the novel is Kilgore Trout, a familiar character very deliberately modeled on the science fiction writer Theodore Sturgeon (1918-1985), a fact which Vonnegut conceded frequently in interviews and which was based upon his own occasional relationship with Sturgeon. Here Kilgore Trout is an itinerant wandering from one science fiction convention to another; he intersects with the protagonist, Dwayne Hoover (one of Vonnegut's typically boosterish, lost and stupid mid-American characters) and their intersection is the excuse for the evocation of many others, familiar and unfamiliar, dredged from Vonnegut's gallery. The central issue is concerned with intersecting and apposite views of reality, and much of the narrative is filtered through Trout who is neither certifiably insane nor a visionary writer but can pass for either depending upon Dwayne Hoover's (and Vonnegut's) view of the situation. 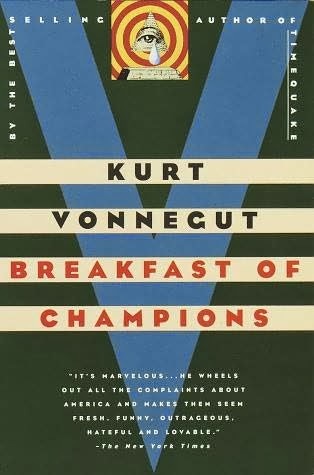 America, when this novel was published, was in the throes of Nixon, Watergate and the unraveling of our intervention in Vietnam; the nation was beginning to fragment ideologically and geographically, and Vonnegut sought to cram all of this dysfunction (and a goofy, desperate kind of hope, the irrational comfort given through the genre of science fiction) into a sprawling narrative whose sense, if any, is situational, not conceptual. Reviews were polarized; the novel was celebrated for its bizarre aspects, became the basis of a Bruce Willis movie adaptation whose reviews were not nearly so polarized. (Most critics hated it.) 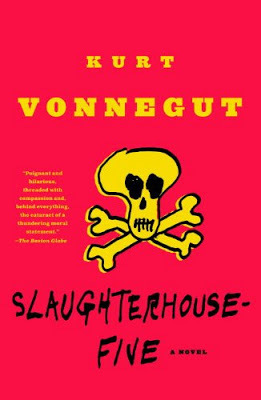 This novel in its freewheeling and deliberately fragmented sequentiality may be the quintessential Vonnegut novel, not necessarily his best, but the work which most truly embodies the range of his talent, cartooned alienation and despair.